Goutflex Review – Scam or the Real Deal? The buildup of crystallized uric acid in the joints can lead to gout. Gout can be identified by extreme pain, tenderness, and redness in the joints. Gout can impact a healthy lifestyle by limiting the bodies movements and making any form of muscle flexing excruciatingly painful. Finding a safe, reliable and effective gout-relieving treatment can prove difficult when assessing the variety of treatments available. 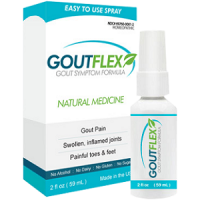 Our review on Goutflex will provide detailed information on this product and its effectiveness in providing relief from joint discomfort. 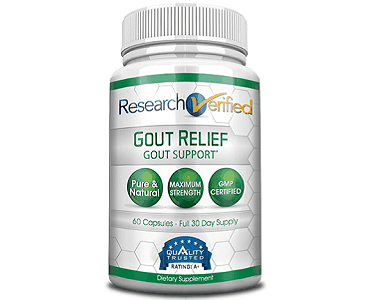 The aforementioned ingredients combat gout by providing relief to a number of symptoms. The ingredients are intended to reduce inflammation, redness, tenderness, swelling, itching, and discomfort. With no known side effects, this natural homeopathic remedy claims to be safe and reliable. While this could be true the lack of other essential pain-alleviating ingredients, such as Tart Cherry Extract, suggests that alternative products may offer further pain relief for consumers suffering from gout. How Do You Use Goutflex? For best results, a dose of Goutflex (spray) should be sprayed directly into the mouth two (2) times daily. Each dose should consist of four (4) sprays and used every twelve (12) hours. In times of severe attacks, Goutflex can be used additionally up to three (3) times per day. A doctor should be consulted in the case of taking Goutflex with other medication to ensure that medications do not conflict. A bottle of Goutflex, which should last up to one month, can be purchased from the company’s online store for $44.95. Goutflex offers a number of discounts for additional purchases and bulk orders. Their most popular package is the recurring ‘buy 2 get 1 free’ special. The going discount price is $84.55 which means that you save $50. While the saving potential is a positive benefit, Goutflex is an expensive homeopathic product when compared to other treatments. Upon further research, we have noted that Goutflex does not offer a guarantee or return policy for opened products. This brings the efficacy of Goutflex to question. While the ingredients may actively fight joint discomfort, the lack of guarantee indicates that sufficient research has not been conducted to determine the effectiveness of this product. 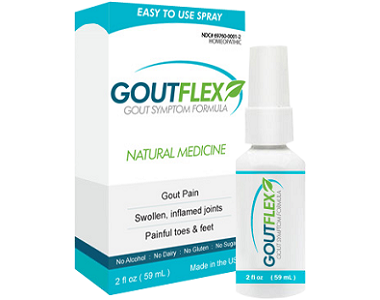 Goutflex combines a number of ingredients that promote joint health and combat gout-related symptoms. While the list of ingredients is extensive, there are a number of beneficial ingredients that have not been included in the formula. Information on the product is clear and concise but the lack of guarantee is enough to make consumers think twice before purchase. This indicates insecurity around this product’s efficacy. Goutflex punts its auto-ship program by offering great deals however, these programs are often difficult to cancel and customers will continue being billed and shipped products regardless of whether they want them or not. It is for these reasons that we cannot recommend Goutflex.